New Musical Express 29-9-90, by Stephen Dalton. Spanish born, London based balladeer, soundtrack composer and occasional novelist, Russo is clearly a busy boy. But that hasn't stopped him sitting down with his guitar, writing and producing this elegant collection of late-night laments and introspective acoustic epics. Costello's wordplay and Robert Smith's pained sighs combine on dashing Euro ballads like “The Fugitive”, and the light-fingered latin jazz title cut with its marvellously incongruous carnival finale. But the prevailing mood is stormy and sombre, as on “Friends Are Friends”, a midnight stroll through neon-lit puddles of sparkling guitar, ant the aptly titled small-hours serenade “Late At Night”. Elsewhere there are passable stadium strums, routine Knopfler-esque struts and an elegant pastiche of early Lloyd Cole called “Years Gone By”. But between the peaks we also find the overlong, Joe Jackson style tricksiness of “Something To Be Proud Of” and two big girls' blouses of bluster “Blind Chase” and “Parallel Lines”- which sound like Tears For Fears without their expensive studio effects. Dull plodders, in other words. But minor gripes aside, Rafa has turned in an accomplished debut of folky, jazzy, bluesy and heartfelt mood swings. Vox , Sept 90, by Stuart Bailie. A Spanish balladeer currently working around London's New Acoustic scene, Rafa Russo has made a debut LP that mixes nervy, insecure moments with a brave, persevering pose. Reference hunters will have a fun time with these songs; I guessed at Al Stewart, Roddy Frame and a boy neurotic TS Eliot. Much of the time though, Rafa pursues a distinctive line, as on the title cut, which suspends a winsome philosophical tune over some cunning Latin rhythms. “Devil's Angel” has a cheerful, jangling tone not unlike Buddy Holly- but once again you'll find that the underlying lyrics are drawn to his familiar, girl-afraid theme. Indeed, the only reservation about this record is that it's really too bleak (“London Clandestine is a killer!) to digest all at one go. There's no doubting his talent, though. Folk Roots, by John Tobler. Rafa Russo, as his name suggests, is a Spaniard and while this enables him to write some very good melodic tunes, his grasp of the English language is less impressive. 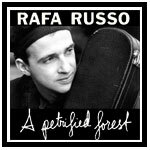 With very tasteful backings involving one Martin Ansell, whose name seems familiar without bringing anything specific to mind, Russo's high, sensitive voice is easy to listen to, but his lyrics seem to betray a lack of comprehension of the language. However, the title track, with its latin brass, is well done even if it's not my kind of music. Devil's Angel is almost a country song in Buddy Holly style; Years Gone By is a pretty fair lost love song and third verse of Late At Night is rather impressive. If he got together with a high-class British lyricist, he could be a real future prospect, because his melodic gifts seem exceptional. London Music Magazine, Nov 90. Russo's voice is fragile, his lyrics concerned with getting through life's trials as unscathed as possible. He seems the archetypal quiet and sensitive type. Luckily he is a craftsman of the catchy melody, and is also cloaked in the alluring mystery of the exile, having left his dark, depressing native Madrid for our lovely capital. Then there's his strange foreign delivery and the odd, out of synch quality of his English lyrics. Anyone who can get away with something like: “I've got my carrier pigeons, one for every star/Then I launch them in the air and leave my door ajar” is heading for all-time cult status. Side Two opens with “Invisible Fire” which could be given a big production job and become a Number One smash for someone like Cher, though it's difficult imagining her singing the lyric “Time creeps like a cat with its silent, treacherous paws”. Things get sunnier on “Devil's Angel” cheerfully arranged with a whiff of Martin Stephenson about it. The final track “Late At Night” finds Russo singing a beautiful tune with an unaccompanied guitar. This song is perfect for sitting yourself down with a bottle of plonk and cry your eyes out about whatever you want. A rare voice within these shores, Russo should be cherished and lionised. Will his next batch of songs centre again on the reflections and doubts of a man of inaction which Russo appears to be and stat to go on our nerves? I for one can't wait to find out. Spanish-born Russo's debut album showcases songs that stubbornly stay with you long after the turntable's been switched off. His 'soft' delivery often conceals a diamond-hard edge that can suddenly cut through what appeared to be a simple love song.